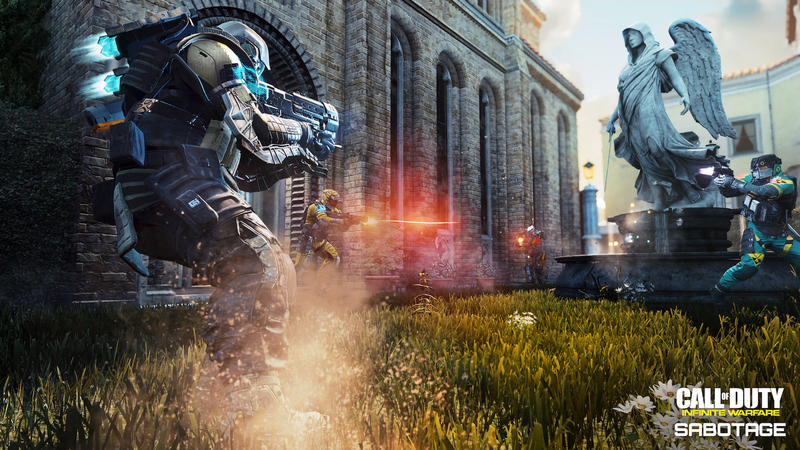 The first DLC pack for Infinity Ward’s latest instalment in the Call of Duty franchise is now available and brings with it four new maps as well as a new Zombie map. Zombies is a new feature for the Infinity Ward developers, and it is nice to see them having some fun with the concept. Three of the maps are brand spanking new, while there is one that is a re-working of the very popular Afghan from Modern Warfare 2–one that fans of the series are no doubt familiar with. 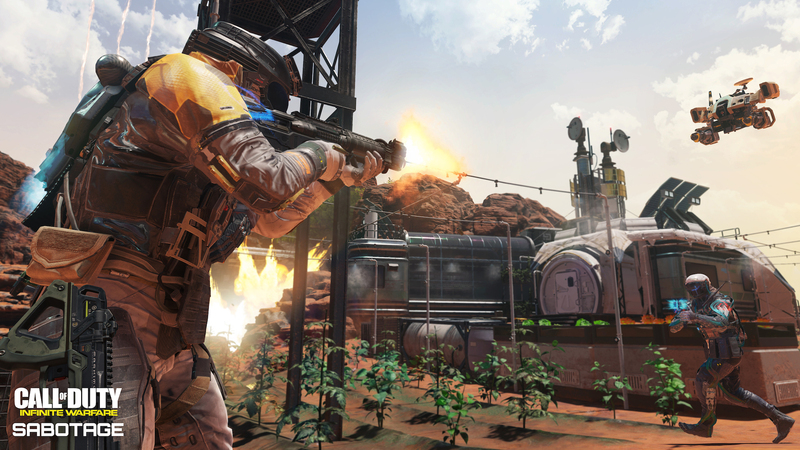 Dominion is a re-working of the very popular Afghan from Infinity Ward’s Modern Warfare 2, now set on Mars. The basic layout is very familiar for anyone who has spent any time with Modern Warfare 2’s multiplayer; a huge open area in the middle dominated by a crashed vehicle with limited buildings and a hydroponics area instead of the wheat field from the original. There are long lines of sight so expect a lot of sniping and limited opportunity for wall running. 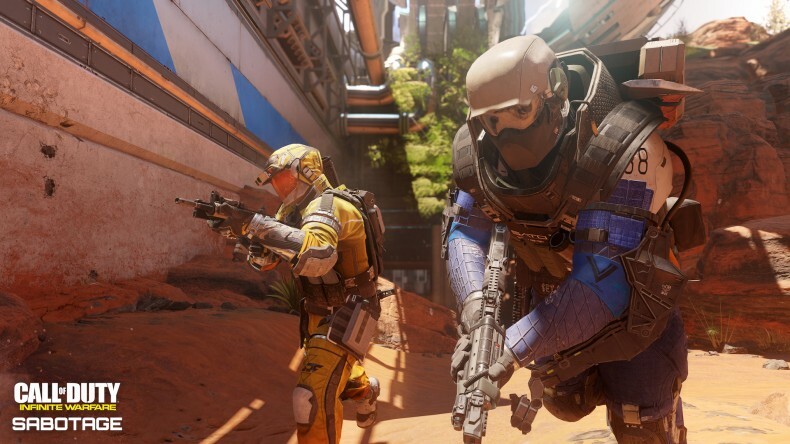 My gut is that this map is the least inspiring of the four in the DLC and may not appeal to the newer generation of Call of Duty gamers because of its size and openness. Renaissance has a very old school Call of Duty feel to it with the small narrow streets and canals of a familiar modern day Venice. A Cathedral dominates the centre point of the map and the level of detail within the building is quite something, with a full gelato menu in one of the kiosks. The map feels very restrained in its presentation and stands out because it feels so familiar from games gone past and its aesthetic is so different to the hyper-futuristic elements of the other maps. Renaissance is a medium sized map, with limited lines of sight and elevation so much of the combat is quick-fire, run and gun style. Perhaps the best map in the DLC, Noir features a sultry blend of the old world and futuristic elements of Infinite Warfare. Set at night in a futuristic Brooklyn with the Manhattan skyline in view, it is a visually impressive map with some strong detail in the buildings. Noir takes a classic three-lane approach, but there is plenty of elevation and opportunity for wall running. There is a slight asymmetrical element to the map with the sidelines being more open and the centre dominated by large two-storey building where most of the action seems to take place. 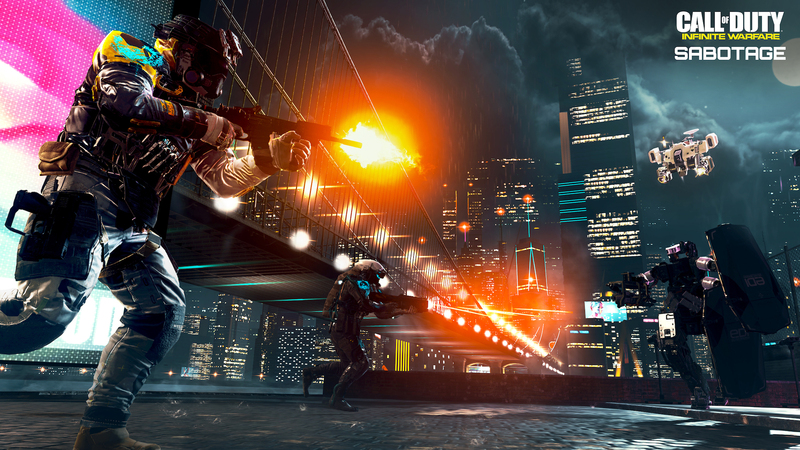 Neon is the smallest map in the DLC, and is a stark contrast to Renaissance with its hyper-futuristic presentation. Taking cues from the Titanfall training grounds, Neon is a holographic simulation map with gleaming curved walls that are just screaming out for someone to run along them. It has some cool effects where players upon being shot disappear into digital blocks, very reminiscent of Tron. There is also some nice visual touches where if you shoot cars they disintegrate in the same way players do, but then reassemble themselves shortly afterwards. Neon has a Z-shaped layout with lots of little areas for the players who like to camp out. There is an eye watering nightclub in the middle ,with garish décor that can be very disorientating and this is where much of the action takes place. 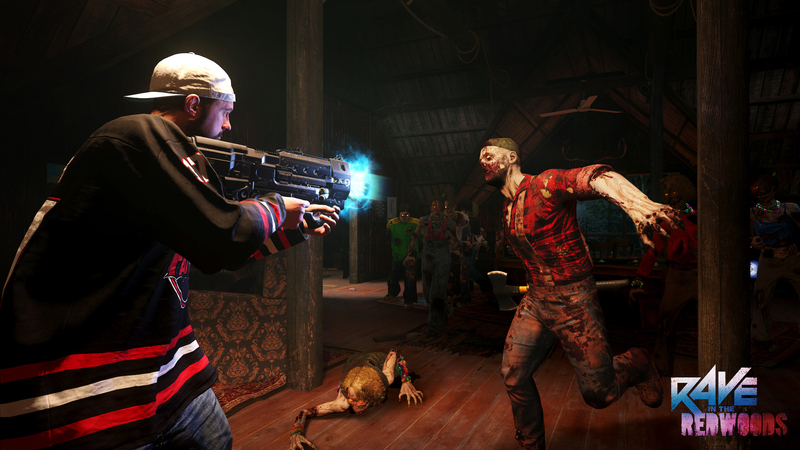 I have mentioned several times that I am not a huge Zombies fan, but Rave in the Redwoods is a positive addition and perhaps the strongest element of the DLC. It begins with another cartoon-style introduction that is pretty funny and parodies a number of “slasher” type movies. The setting is a lakeside camp in the woods which is playing host to a dance party. There’s plenty to explore in this freaky forest–in one particular area you can initiate a hallucinogenic experience that sends you on a psychedelic trip, complete with neon painted undead and talking butterflies. As with previous instalments, you collect cash to unlock new areas and purchase weapons. There are also plenty of melee weapons lying about that don’t use the currency system at all which is a nice change of pace. The cast is suitably witty with a cameo from nerd champion Kevin Smith, whose oddball wit fits perfectly with the Zombies style. This map is sure to keep fans busy for some time, or at least until the next pack is released within the next couple of months. 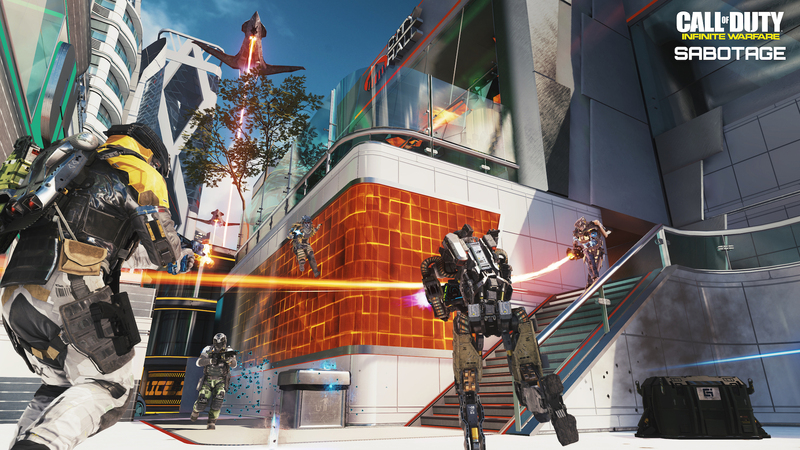 Sabotage is a good introduction to the DLC schedule for Infinite Warfare, with some solid multiplayer maps and a very strong Zombies outing.